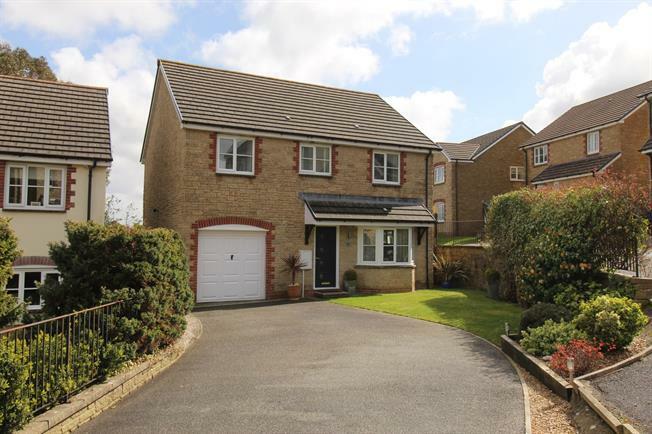 4 Bedroom Detached House For Sale in Wadebridge for Asking Price £380,000. This wonderfully spacious extended family home is presented to an extremely high standard throughout. The property offers a fabulous open plan kitchen dining room and extended additional family room, four generous bedrooms with en-suite to the master. The property also benefits from an elevated position which provides beautiful far reaching views across the town and the countryside of Bodmin Moor. To the front is a driveway providing off road parking for four and to the rear a super enclosed garden also enjoying the stunning views. Viewings are highly recommended. UPVC door to front aspect, wood flooring, stairs leading to first floor, door to cloakroom and door to lounge. Radiator. UPVC bay window to front aspect, double doors leading to the dinning room, feature fireplace with an inset gas fire. Radiator, carpeted flooring. Stunning refitted contemporary, modern kitchen comprising a double glazed uPVC window facing the rear. Radiator, wood flooring, part tiled walls. Roll top work surfaces, a range of modern wall and base units, one and a half bowl sink with drainer, integrated electric double oven, integrated gas hob with an overhead extractor, integrated dishwasher and integrated fridge. Access to the utility room. Ample space for a family dining table. Opening into the family room. Wonderful light and airy family room with uVPC door and windows to the rear maximising on views to the rear and garden. UPVC double glazed door opening onto the garden. Roll top work surface and stainless steal sink with drainer. Door leading to the integral garage. Space and plumbing for washing machine and dryer. Access to bedrooms, bathroom, airing cupboard and loft access. Double glazed uPVC window. Radiator, carpeted flooring, fitted wardrobes. Access to an en-suite. Double glazed uPVC window facing the front. Separate shower cubicle, low level WC, wall mounted wash hand basin. Part tiled walls. Heated towel rail. Double glazed uPVC window to front. Radiator, carpeted flooring. Double glazed uPVC window facing the rear. Radiator, carpeted flooring, a built-in wardrobe. Double glazed uPVC window to the rear. Radiator, carpeted flooring, a built-in wardrobe. Double glazed uPVC window. Low level WC, wall mounted sink, panelled bath. Part tiled walls. Up and over metal door. Lighting and power connected. Integral door to utility. To the front is a driveway leading to the garage proving ample off road parking for several cars. Side access to the enclosed rear garden which provides several seating areas is lanscaped and mainly laid to lawn.